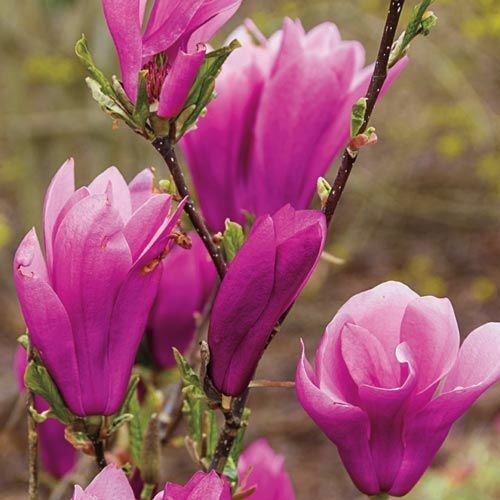 Jane Magnolia | Gurney's Seed & Nursery Co.
A heavy bloomer of striking colored flowers (will sometimes rebloom in midsummer). Late flowering in the South (mid April to early May), this variety avoids late frost damage. Deciduous leaves emerge with copper-red tints and turn green over summer, changing to yellow, bronze and copper tones in fall. 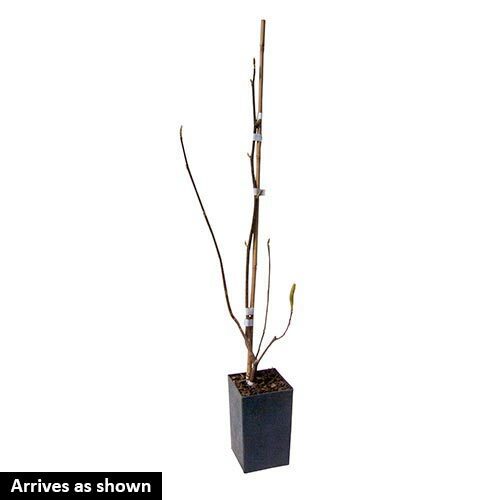 Compact, shrubby tree matures at a well-behaved 10' -15'. Very hardy, proven performer in Zones 4 - 8. FoliageOvate, medium green, leathery leaves, up to 6 inch (15 cm) long. Leaves emerge with copper-red tints and turn green over summer. Leaves turn yellow, bronze and copper tones in fall before dropping for winter. Flower Form7-9 inches (18-23 cm), cup-shaped, tuliplike flowers. BloomsMid spring. May rebloom in midsummer. Soil RequirementsWell-drained, organically-rich, acidic, moisture-retentive soil. PruningPrune to desired shape and to remove dead and broken branches. After flowering. CommentsAbsolutely gorgeous, tulip-like flowers of reddish-purple appear in mid spring, flowering after other varieties like Star Magnolia. Later blooms means less likely damage from a surprise frost and a healthier flowering. DepthPlant so the roots are below the soil line.